My Tights won't Stay Up! So. Jeans shopping. It has to be up there with one of the most demoralising things a woman can do in a town centre bar, of course, food shopping or having to explain for the bajillionth time what ‘Ms’ means to the young chap in the Carphone Warehouse. A friend recently said to me 'you know, I used to wear jeans to be comfortable' and I sighed, because those days are long gone and experiencing endless displays of jeggings with varying degrees of reliable elasticity have taken their place. On days when I miss the feeling of being mildly suicidal, I head straight for my nearest H&M with their heinous changing room lighting and enormous pictures of on-trend misery. 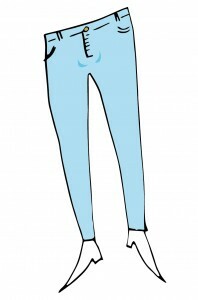 My esteemed co-blogger Flora hasn’t bought a pair of jeans in eleven years, as she finds the act of jeans shopping so stressful. 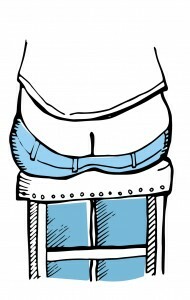 Why do I insist on pursuing ‘the perfect jeans’ you might ask? Because, dear reader, I WANT soooo badly to just be able to casually throw on a T-shirt and jeans (think Winona Ryder in ‘Reality Bites’ - that film ruined my young life in so many ways and is another blog post in its own right) without looking like someone dressed humpty dumpty up as a member of B*witched. Let me ask you this, since the popularity of the low-rise jean, is there any one of your friends' arses you've not seen in it's entirety? No, didn't think so. Remember the cover of Janet Jackson's 'Janet' album in 1993? Yeah, so do I all you other people in your 30s and 40s (google it everyone else) and it can naff off. That's where it started and it just snowballed from there. Admittedly it might have been worse, 'man-as-bra' could've been a thing. 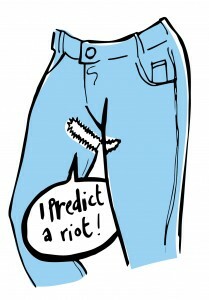 Perhaps a style of trouser that only partially does the bottom portion of its job is the lesser of two evils. This is not the unique preserve of jeans, but an unruly zip is a regular denim occurrence in my experience. And zip malfunction always seems to strike when I'm most at pains to look like someone who's not been ferreting around in their under-crackers. So you're in Matalan, you find a pair of jeans that don't turn you into an unwitting mooner, you don't have to do that thing with a hanger to get the zip done up, they're just the right length and they have can-easily-extract-mobile-phone sized pockets. Perfect... Oh wait, why is there lots of extra denim around my fanny? Is my fanny too small for these jeans? Are these men's jeans? Is that a gap for balls? Oh bugger, better get that massive jumper as well then. *So called because my substitute RE Teacher's trousers never failed to burgeon around her fanny area. Thanks Mrs F! Anyway, The 'Boyfriend' jean, thusly named so we can look all cute and dishevelled as if we'd stayed at a fella's, spilled lasagne down our own trousers and had to nab his for the walk of sh...I mean to arrive home like a scruffy ingénue at 6am, perhaps on the back of a milk float. Except that is never how these jeans work in my experience. They are saggy and badly shaped and I always end up looking like I'm wearing my mum's jeans, not Thierry Henri's by a pool. Anyone without a mythical thigh-gap will recognise this one, particularly if they've ever coupled having pretty ordinary, non-Cara-Delvigney legs with lycra-impregnated denim. The blighters wear away and one is left with yawning, frayed angry-at-the-jean-establishment chasms perilously close to the gusset. I like to think this is my thighs jonesing for their own ripped rebellion, it's their own social movement, THEY WILL NOT BE REPRESSED! 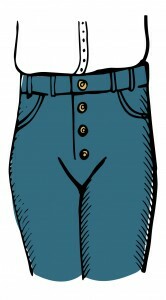 Ah the high-waisted all-denim trouser, not for the faint of spleen. These babies will hold EVERYTHING in, and they have to, because putting them on makes your innards explode and you need the tough retaining properties of this garment to make it to hospital without spilling your vital, and not so vital, internal organs everywhere. The very worst category of skinny jeans are the low rise ones, I always feel bisected like an arse-baring, denim-clad anthropod who's unable to bend their knees to tie their shoe-laces i.e. a be-trousered idiot. Skinny jeans were invented by someone who either hates women and wants us all to have deep-vein thrombosis and thrush, or loves it when our legs look like sausages and wants us all to have deep-vein thrombosis and thrush. And for the fellas regarding skinny jeans: without nuts of my own I can’t possibly comment from first hand experience, but I have it on good authority that Skinny Jeans, as well as being the Regina George of girl’s best friends, can actually mess with your junk boys... don’t mean to alarm you but (whispers)… twisted testicles. When I am Queen, I think I will pass a law allowing only Noel Fielding to wear skinny jeans; he's the only person who looks any good in them and presumably he's able to cope with having his love spuds denimed to mash. In addition to the above, there are obviously vintage jeans issues such as '80s Deep Bum’ and '70s Squatters in Trousers’. Rest assured a blog about the joyful musk and ill-fittingness of vintage apparel is in the pipeline and will deal with period denim and its many evils.